Sew much fabric....sew little time! 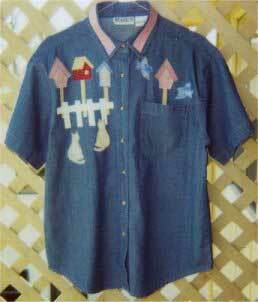 Birds, birdhouses and cats complete this delightful denim shirt. The applique patterns would also be great on a hanging wall quilt! This is another easy and fun shirt to make, so enjoy sewing!!!!!!!!! !